Author Robert Dewar worked for Ford in the 1970s after a stint at Proctor & Gamble and many years of business school training. He walked away six years later appalled at what he experienced. Some 25 years later, he dug out his old notes and compiled A Savage Factory as a chronicle of his time on the factory floor. This book draws you right in and will hold your interest. Dewar’s writing style attests to this being a self-published effort. That is also where the strength of his arguments are made. He makes no effort at offering facts and figures. Rather, he relies on his own first-hand accounting of what he directly witnessed at Ford’s Sharonville, Ohio transmission plant. You can draw your own conclusions. 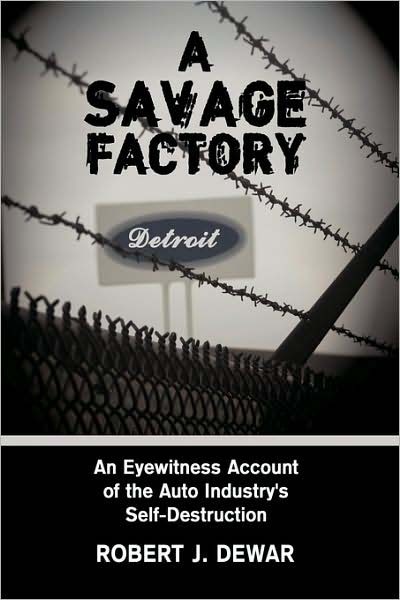 A Savage Factory is replete with graphic stories confirming his disbelief at the manner in which Ford management and the United Auto Worker’s labor union warred with one another over seemingly common production goals. While management operated as though workers were only there to cause trouble, workers operated to the letter of the contract and could/would go so far as sabotage to prove their power. Neither side, in Dewar’s accounting, was capable or willing to concede anything to the other. The dehumanizing effects of repetitive assembly line work were counteracted by high wages. Management sought only to maximize output, again with high wages to compensate for driving men to the loony bin. All at the further expense of declining production quality. The author never gives us a calendar frame of reference for his experience. He dives right in with his first gruesome day and the game is on. A better setting of the historical stage would have helped. Dewar’s tale comes from the Ford factory floor, but he alludes to hearing similar stories from managers at GM and Chrysler. The classic management versus labor battle was eventually won by superior quality imports from Japan and Germany. In so many words, the American auto industry didn’t lose market share, they gave it away through complacency, arrogance, and worn out corporate/labor policy. A Savage Factory is an engaging, quick read that raised my blood pressure a time or two along the way. Congratulations to Robert Dewar for making it out alive, having the wits to keep copious notes, and completing a worthwhile book.